No cheating! 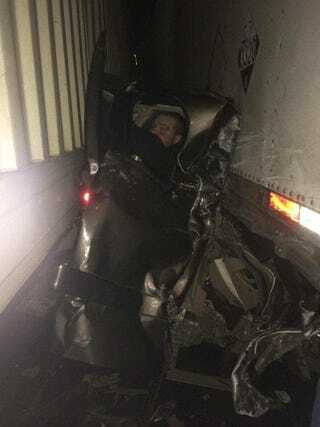 The guy was sandwiched between two Semi's in that horrible crash in Oregon. After his vehicle was dismantled enough for him to escape it, he walked away with nothing more than a black eye. So, can you figure out what he's driving? You can read more about the accident and his miraculous survival here. Spoiler warning: They tell what the vehicle was in the 3rd paragraph.